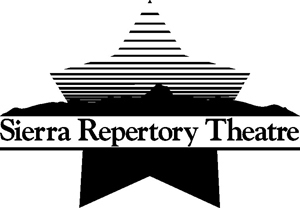 Molly is headed up to SIerra Reperatory Theatre in beautiful Sonora, CA to perform in a new musical. Dino - RAWR performs March 15-28th. Join scientist Dr. Creat as he proves to YOUR students that he has indeed done the miraculous and created dinosaurs! Not only that, but these dinosaurs can sing, dance and perform awesome tricks. Can he keep a blast from the past under control? Or will Dr. Creat become extinct? Molly is singing with professional caroling company, Tis the Season Handbell Carolers. She will be performing at Disney's Caifornia Adventure as a Buena Vista Street Community Bell Ringer. Come see her sing this holiday season! The holidays start early November at the park. 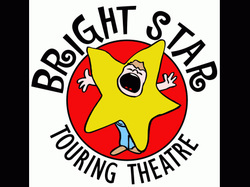 Molly is starring, singing and playing guitar, ukulele and mandolin in three touring shows with Bright Star Theatre! Bluegrass & Tall Tales: We’ve combined two of our favorite things: Great American literature with some toe-tapping bluegrass interludes! Join our musical actors as they bring to life some of the best American Tall Tales in this upbeat production. The stories of Daniel Boone, Johnny Appleseed, and Paul Bunyun to name a few, while interspersing these tales with some old fashioned southern style bluegrass music. Soundtrack to Freedom: Celebrate American history through a timeline of music. Join our professional performers as they carry your audience on a melodic journey through chapters of American History. From tribal songs of the early Native Americans, to influential anthems of the Civil Rights Movement, this show leaves few tunes unsung. Audience interaction abounds with sing-alongs in this original Bright Star musical concert. Christmas with Santa : Carols, Santa & Christmas Galore! The spirit of the holidays are celebrated in this hysterical Christmas-wrapped comedy–two hilarious elves have misplaced most of Santa’s presents. When Santa arrives he teaches the well-meaning elves that the real gift of the season are the people and friends we celebrate it with. Christmas with Santa joins this tour November 4th. Molly is cast at the Alaska Cabin Nite Theatre! Molly will be performing at the Alaska Cabin Nite Theatre in Denali National Park, Alaska! She has been cast as Mary Lee-Davis, real life author of the book "We Are Alaskans". Molly will be in Alaska May 3-September 21st! Presented at the McKinley Chalet Resort, you’ll enjoy a night of fun, festivity and food! 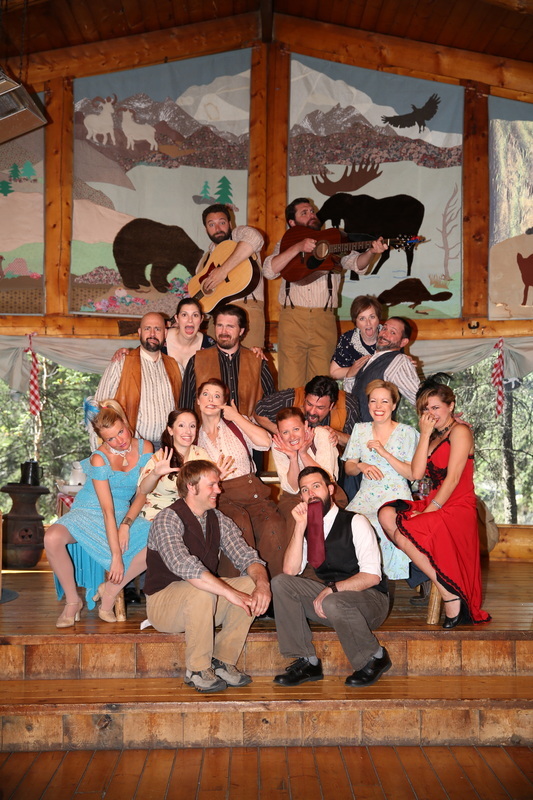 Get a taste of old-time Alaska at Alaska Cabin Nite Dinner Theater– the popular dinner theater performed in an authentic, log-paneled roadhouse. Join our heroine Fannie Quigley and an unforgettable cast of characters in this true-to-life Gold Rush tale of adventure in early 1900s Alaska. It's a great mix of colorful storytelling, spirited music and humor, brought to life by talented performers. 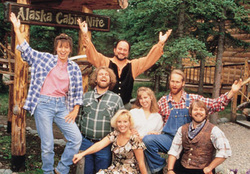 Everyone in your group will love the lighthearted entertainment and hearty cuisine of Alaska's most unique Cabin Nite Dinner Theater. Watch the Cabin Nite Video! Price: $63 for adults, $31.50 for children (ages 3 - 11). Children under 3 are free. 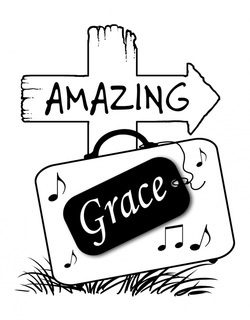 Fantastic review for "Amazing Grace"! 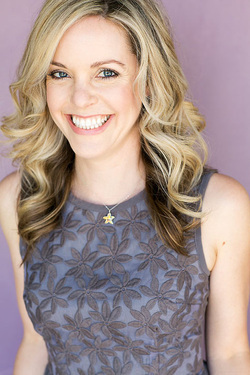 Wow, great review for my show, Amazing Grace: "Actress Molly Laurel in her role as the town newcomer, Grace, sings effortlessly, inspiring listeners to attend more live performances by professionals like her for a night of entertainment rather than sit home watching televised American Idol hopefuls fish for notes." Molly's cast as the lead role in a new musical! 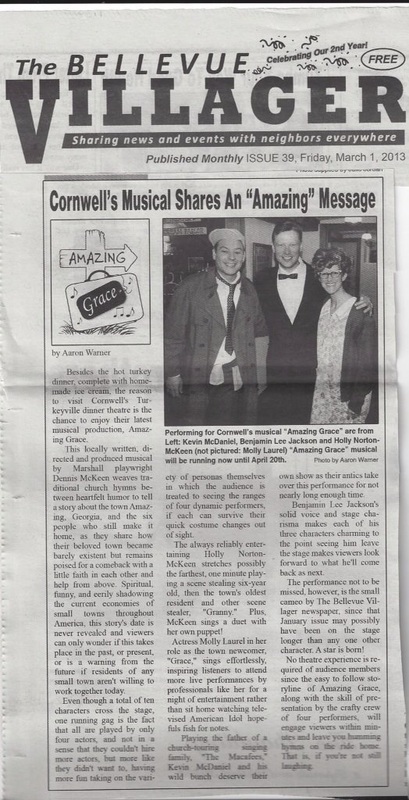 Molly is cast as Grace, in the new Gospel country musical, Amazing Grace, at Cornwell's Theatre in Michigan. A wonderful story about a girl named Grace and a town named Amazing. The story starts when Grace lands in the small town of Amazing. It seems like a very friendly town with all kinds of folks: a used car dealer, all the great people at the diner and the local beauty parlour gals. The town had been waiting for years for the road to go through their town and save the it from being taken off the map. Grace helps re- store the faith and love to the small town that needs it so much.